Larry "Slick" Evans arrived in country and was assigned to C 2/5 Cav while it was operating out of The Oasis, a major staging area for operations in the Center Highlands. He was told by his new squad leader (who stuttered) that he was replacing a good man. Webmaster Note: We If you know the identity of the squad leader, please contact the Webmaster. As to Larry's comment that he replaced a good man, the last major action we know of was September 21st, when seven C 2/5 Cav troopers were KIA. If anyone knows of another firefight between September 21 and October 25, please contact the Webmaster. 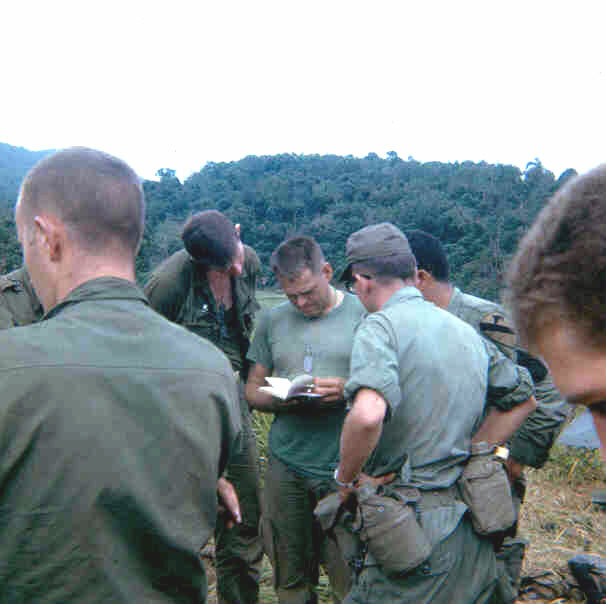 Commanding Officer CPT Charles (Chuck) Fry is shown here looking at a book. Far left, bareheaded and back to the camera is David Carroway, a Forward Observer with the Mortar Platoon. Looking over CPT Fry's shoulder is First Lieutenant Dana Gerald, while Sergeant First Class Adolfo Salazar looks on from the other side. The name of the trooper with glasses is unknown. 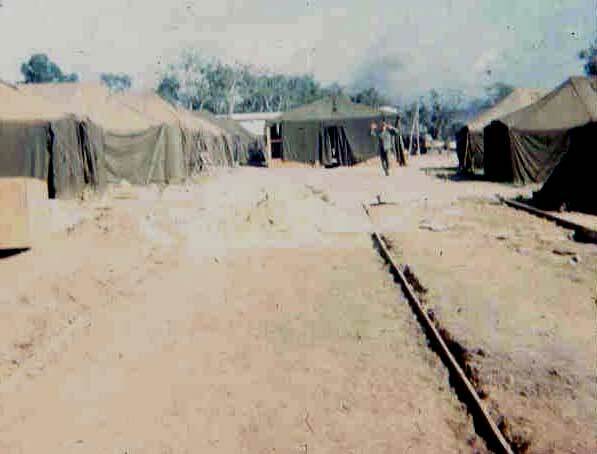 The 1st Cav had been in Viet Nam for over a year, and Camp Radcliff at An Khe was still being built. Ray Long took this photo as he was joining the company in October, 1966. The ground is being prepared for pouring a concrete slab for a new building in the battalion area. Compare this picture to earlier pictures of An Khe in November and December 1965.